Guys, we just wanted to let you know that we will not be exhibiting at this year’s Frankfurt Musikmesse. 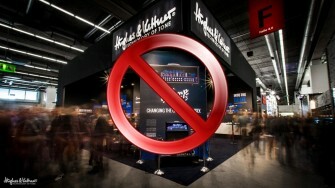 You heard that right: there will be no Hughes & Kettner stand at the show this year. If you do business with us, don’t fret: all our sales people will be around throughout the Prolight + Sound 2016 show at the same venue between April 5 and 8. They will be based at the HK Audio stand’s business area, situated at Hall 3.1 A81.